Amy Ruiz Fritz October 20, 2014 October 20, 2014 1 Comment on Happy Information Overload Day? Anyone seeing the inherent irony yet? 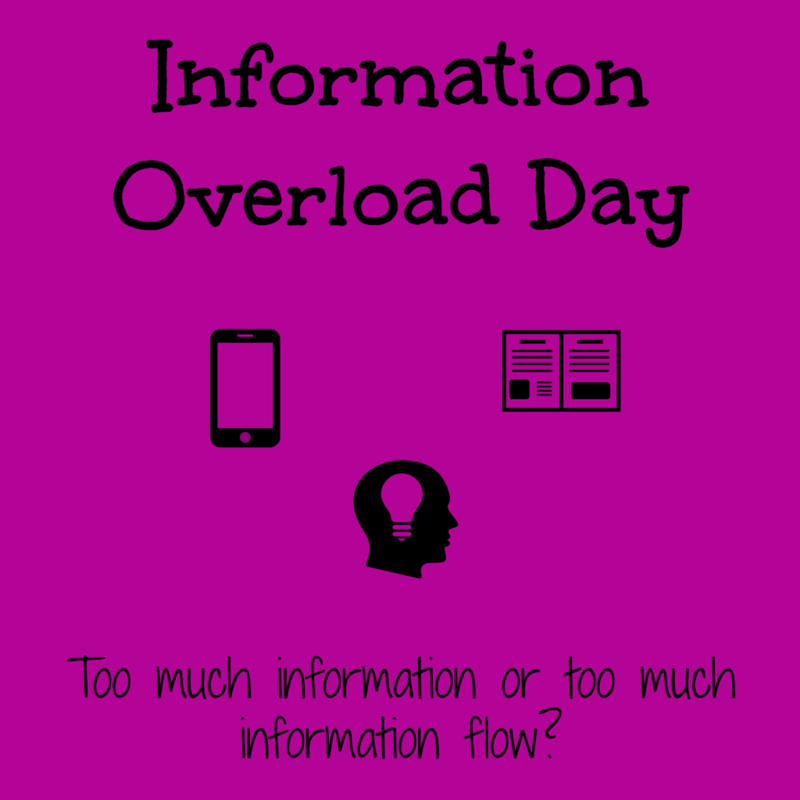 How about the webinar about information overload? Granted, for me there really can be no such thing as information overload. I can’t stop learning about new crap. It’s just who I am…more input! Of course, it’s more about information flow. Too much information at once will blow out anyone’s circuitry. You have to control the flow. Back to my original point, I know multi-tasking is bad, but it keeps me from getting bored. How many of us watch TV and do something on the internet at the same time? Do you know I rarely just watch TV. There’s always a computer or some smart device within arm’s length. The other day, I just sat and watch the movie Monuments Men and it was lovely. OK, I admit to looking up one or two historical facts about which I had questions, but for the most part, I just sat there and watched. I think that’s why I like going to the movies. I’m forced to just sit there and watch. Taking out my iPhone would be rude, so I just soak up the movie. Of course, I have the thing out before the show, but once the lights go down and the previews start, it goes away. Maybe that’s how I should cut down on the information flow. Just sit and watch TV every night without a smart phone or tablet in my hand. It might be relaxing. Imagine that! Families, what needs to change in Corporate America? My thoughts exactly!! Give them the goods!